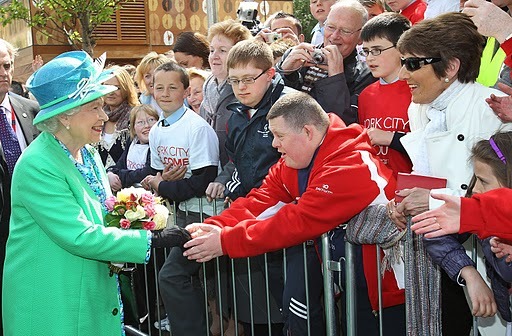 The Queen meets members of the public outside the English Market in Cork on Friday. Welcome to Obama land. The man himself came on Monday in search of the missing apostrophe and found a welcome to match Reagan, Clinton, even Kennedy. The outpouring of affection for President Obama was extraordinary. He packed in an incredible amount in just one day and still managed to be laid back and cool in spite of the schedule, the high winds … and Taoiseach (Prime Minister) Enda Kenny plagiarizing his famous victory speech. There was something a bit slithery about Kenny and his attempt to piggyback on Obama's popularity before the vast crowd in Dublin. But it didn't matter. The day was bigger than any Irish politician, especially a taoiseach who would never be able to draw such a crowd on his own. It was an impressive performance by Obama, even down to finishing his pint of Guinness in the Moneygall pub and clearly relishing it. That's more than Clinton or Reagan or even JFK did. And on such small details are eminent visitors judged by ordinary Irish people. Is the guy genuine? Obama passed the test. It wasn't just the star quality -- although he and Michelle have that aplenty. It was the fact that he was genuinely enjoying himself, that he was able to josh and joke with ease and that there was a shake and hug for everyone. Is it any wonder they loved him? We could go into the Obama visit in detail, but since state broadcaster RTE was virtually taken over by our own Niall O'Dowd on the day, we bow to someone with real access and insight. If you want to get the impact and significance of the Obama visit, read Niall in this paper and on Irish Central. Instead we are going to reflect on the impact and significance of Obama's predecessor in the big league visitor stakes, the Queen, who was here a few days before. That, of course, was a more formal and less touchy feely visit. But as far as impact and significance are concerned, it was probably the more important of the two. Given the level of worry, even paranoia, that preceded the Queen's visit, it's clear that no one foresaw how successful it would be. Whatever about the security problem, most of us here -- including yours truly -- expected that the visit would generate little excitement or even attention at a time when we have such huge economic problems hanging over us. But we were all wrong. People did turn out to see the Queen, to get as close as the closed off streets and very restrictive security would allow. The numbers on the streets were nothing like they were for Obama a few days later, but they were impressive nonetheless. And the sheer delight in people's faces was unmistakable, even after catching just a glimpse of Her Majesty. Of course, as with Obama, the celebrity factor was at work. Ever since Diana, that has been a factor for the British royals. And the Queen's visit here came in the wake of the royal wedding. But it was more than that. The people who happened to get near her and who talked to the media afterwards were on a high. They were absolutely delighted. It wasn't anything subservient, and there was no groveling, or even bowing or curtseying. The delight seemed to come from genuine affection and admiration for a remarkable woman. One interesting theory is that, now that the bishops, the princes of the Catholic Church (in their queenly robes), no longer attract awe or even admiration, a royal visit gives us something to go a bit silly over. The Irish, like anyone else, love a bit of pomp and ceremony. The visit by the Queen was a triumph. We can't undo the past, the 800 years of colonization, the recent Troubles and all the rest of our bloody history. But as the Queen said at the state dinner in her honor, we can bow to the past but we don't have to be bound by it. Our President Mary McAleese referred directly to colonization and its lasting legacy, but also said that the time had come to put the past behind us and look forward. The Queen's speech referred to the personal loss of so many, including by implication herself, a reference to the IRA murder of her favorite uncle and mentor, Lord Mountbatten. There was no doubting the strength of her feeling, even though she passed it off in her usual reserved tones. That hurt is more than most have had to bear here. But she has come to terms with it. She has moved on. And if the Queen can do it, surely the rest of us can as well? It really is that simple. The Queen wanted to put a line in the sand, however blood-soaked, and encourage us all to move on. In that way, as far as she was concerned, the purpose of her visit was clear. This was something she wanted to do before the end of her time. We can never heal the wounds of the past altogether. But we can decide to move on. There is no reason why, in spite of our history, Britain and Ireland cannot now be not just good neighbors but close friends as well. In the same way that the Irish built America, the Irish have played a huge role in the U.K. A million Irish born in Ireland live in the U.K. and six million have direct Irish connections. right through the Troubles when Gerry Adams' mates were blowing up British cities and trying to murder members of the British government. Over the years, the British have gone out of their way to recognize the special relationship we have. Even recently, when we were stuck, the British chancellor took a lead role in contributing billions to stop us going bust. Yes, there have been centuries of oppression, but that's what colonial powers did in the past and the British were not the only ones at it. The truth is they have been making up for it as best they could over the past century. It would have been far easier for them to walk away from the North, for example, instead of seeing their soldiers shot from behind the hedges. But they couldn't because of the Unionists they had planted there centuries before, and the responsibility they felt towards them. Terrible thing, duty. And history. moment in the history between the two islands. She also paid tribute to the Irish who had fought alongside the British in two world wars. Many of the tens of thousands of Irish who died in World War I fought for the promise of Irish freedom. Many fought because it was a job that put bread on the table at home. Those who survived came back to a hostile reception, and most kept their bravery to themselves and hid their past. No American seems to feel that it was shameful to serve in World War II, or that doing so made the person a West Brit or only Half American. But in Ireland the tens of thousands who fought in the first or second world wars have always been somehow suspect. The Queen's visit will help to change that -- and not before time. One thing that charmed and won the admiration of people here was her energy and resilience. Like the thoroughbreds she inspected in the National Stud here, she has real staying power. She never flagged through a three day schedule that would have most people -- never mind an 85-year old granny -- in need of a rest. The days were long, and so were the walks down pathways, through endless lines of politicians with their hands out. She was up and down flights of steps. dear a chair and let her have a sitdown. But one suspects that, tired though she must have been, she would never have agreed. Straight back and stiff upper lip, old boy. That's what won them the empire. There was, as I said, such paranoia about the few dozen Republican fringe lunatics and what they might get up to that the whole place was in lock-down for the visit. Which was a pity. Because it meant the Queen was driven though empty streets. Maybe she thinks everyone has emigrated? And she had to meet far too many lines of politicians and minor dignitaries rather than real people. When she was allowed close to ordinary people her delight was obvious, particularly on the last day in Cork when the penny had dropped that crowds of people were keen to meet her and the security seemed to relax a little. That last day was like the sun coming out. She got a great reception in Cork, the Rebel County. Again, no one was fawning. But the pleasure in meeting her was unmistakable. She bantered with the traders in the old English Market in the city, laughing at the jokes and giving as good as she got. By then the realization had sunk in. Unlike Obama, the Queen may have spurned the pint of Guinness. But clearly the woman was genuine. She really wanted to heal the past and lay down a marker for a new beginning.